The Telecom Regulatory Authority of India’s (Trai’s) performance indicator report for the March 2018 quarter shows that the industry’s woes continue. Kotak Institutional Equities points out in a note to clients that consumer-level wireless spends (including service tax) fell to ₹ 29,800 crore in the March quarter. That’s down from a peak of ₹ 44,700 crore in the June 2016 quarter, the last ex-Reliance Jio quarter. As such, the reduction in wireless bills works out to ₹ 59,600 crore on an annualized basis. 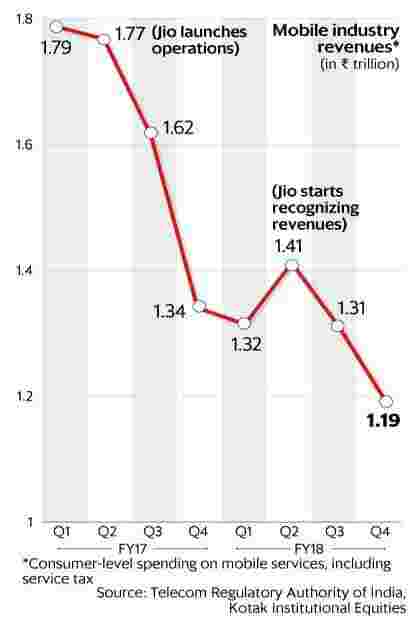 On an average, based on this data, consumer spends have fallen by 33% since Reliance Jio’s launch. While these computations are based on Trai’s quarterly report, there are some adjustments made by Kotak’s analysts. While this is a bonanza for consumers, it is a nightmare as far as profitability of the sector goes. Each of the companies in the sector is burning high amounts of cash, with revenues barely able to meet operating expenses, leave alone capital expenditure. This means that banks with exposure to the sector can get into further trouble. Also, as mentioned earlier in this column, lower revenues for the sector mean lower collections for the government. Telecom firms pay around 12% of adjusted gross revenue to the government in regulatory fees, apart from being the goose that lays the golden egg whenever spectrum auctions are conducted. Inflows from the sector have already come down considerably for the exchequer. Kotak’s analysts also point out that consumer-level spend on wireless services fell to as low as 0.66% of nominal gross domestic product, compared to 1.2-1.3% pre-Reliance Jio. “It is a new low in what was already a global-low ratio, and far below underlying spend potential," the analysts said in the note.